Translated by the Holy Transfiguration Monastery. Softcover binding. 352 pages. 2-color printing. 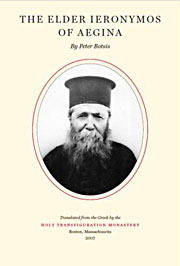 Father Ieronymos the Cappadocian, the renowned Elder of the isle of Aegina in Greece, was an exceedingly compassionate healer of souls, a clairvoyant Father-confessor who saw the secret thoughts hidden in the heart, and a man of unceasing prayer who attained to the heights of the vision of God. Those who came to know him exclaimed that they had met another Saint Isaac the Syrian. His complete life is now available in English for the first time, written by those who knew him personally.